Meanwhile, in the high temple of modernism -- New York's Museum of Modern Art -- curator and past New American Paintings juror Laura Hoptman has just opened The Forever Now: Contemporary Painting in an Atemporal World. 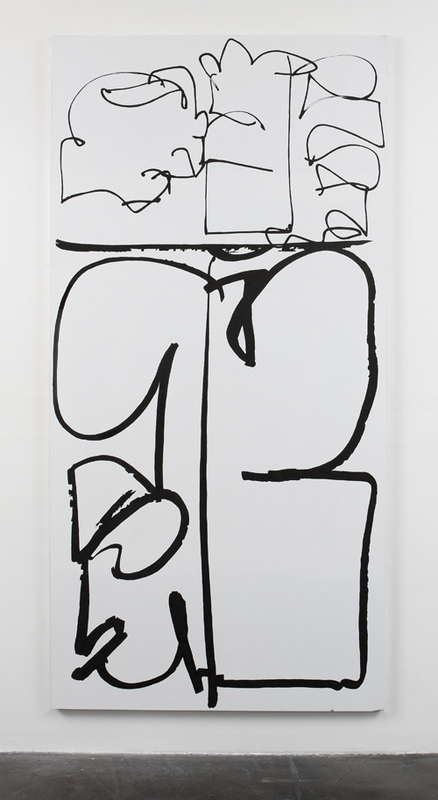 The exhibition features the work of seventeen painters, including Joe Bradley, Matt Connors, Mark Grotjahn and the young and controversial phenom Oscar Murillo, and is the institution's first serious group show on painting in a number of years. Most of the artists in this show are art market favorites, so stay tuned as the critical writing on this exhibition is sure to be a roller coaster ride. So what does 2015 hold for the oldest of mediums? As always, it is anyone's guess. Due to my unusual perch atop the thousands of applications that we receive each year for New American Paintings, I can offer a few observations. Firstly, and as suggested above, Zombie Painting, or what I have alternately called Process Painting, is running rampant, both in the gallery system and in the halls of America's art schools. There is no doubt that it will continue to be widely exhibited in 2015, even though much of it seems to have little more content than its own ability to circulate. Secondly, I have noticed a lot more representational painting being made in the past year. After a number of years when painting about painting has been all the rage, a large number of emerging artists are returning to imagery as the foundation of their work. Lastly, whatever mode artists are interested in working in, an increasing number seem to be favoring a "skilled" versus "deskilled" aesthetic. That is to say, painters are not being shy about showing just how fluent they can be with the medium. An interesting byproduct of the past decade is that somehow "unfinished" came to represent "serious" in the eyes of many. Eddie Martinez. Courtesy of Kohn Gallery, Los Angeles. Putting together a list of artists to watch in 2015 is a highly subjective and admittedly shallow affair. In doing so, I thought long and hard about all of the exhibitions I saw, studio visits that I made and conversations I had in 2014. Some of the artists on this list are relatively new to me, while others are artists I have been following for years who made such incredibly strong work in 2014 that it seemed like a breakthrough to me. Some I had made my mind up about months ago, while others caught my attention for the first time or recaptured it while I was in Miami just two weeks ago. As always, I am eager to hear your comments -- do let me know who is on your list. I first came across Backman's work at Mixed Greens in New York City in late 2013. The work stuck with me, so when we were reviewing applications for the upcoming Northeast issue of New American Paintings, which he is featured in, I was excited to see him in the mix. Backman's work is extraordinarily complex, but visually generous, which, for me, makes for truly satisfying work. His work operates in the very fluid space between material and simulated states, and like Jasper Johns, Backman is able to make objects that are true to their own structure, even as they critique and undermine the visual systems that allow them to function as art. Look for an upcoming solo exhibition at James Fuentes in 2015. Conor Backman. Courtesy of the Artist. Benning made her first splash in New York's art world as a video artist. She gained attention fast and at age twenty was included in the 1993 Whitney Biennial. Benning's video work was subsequently included in the 2000 Whitney Biennial, and she was given a solo show at the museum in 2009. Given that drawing has been so essential to her video practice, it is perhaps not surprising that Benning has started to produce actual objects. Her recent solo at Callicoon Fine Arts in New York City was my first opportunity to see her two-dimensional work in depth. 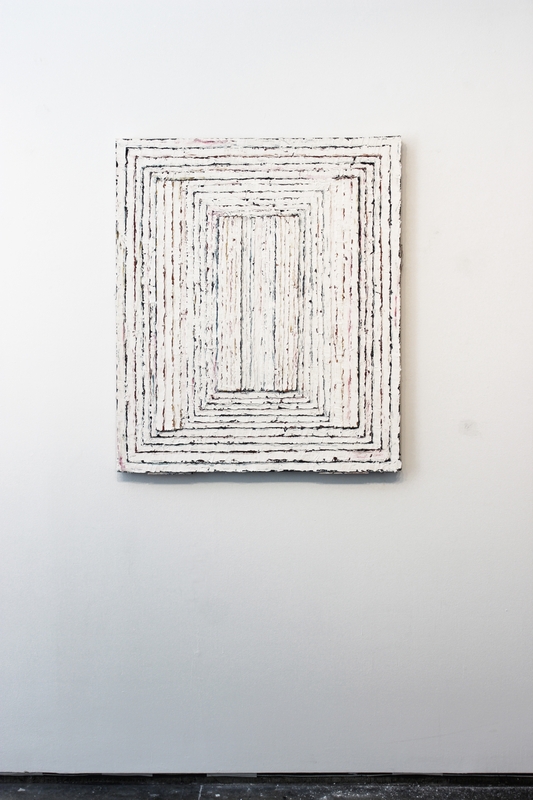 Comprising a variety of media, including resin, fabric, paint and found photographs, Benning's paintings may seem to fall neatly into the category of "geometric abstraction"; however, she has a lot more on her mind then formal issues. As in her video work, Benning is ultimately interested in exploring and critiquing systems of social order and control. To my eye, the jump to another media has worked out well for her. 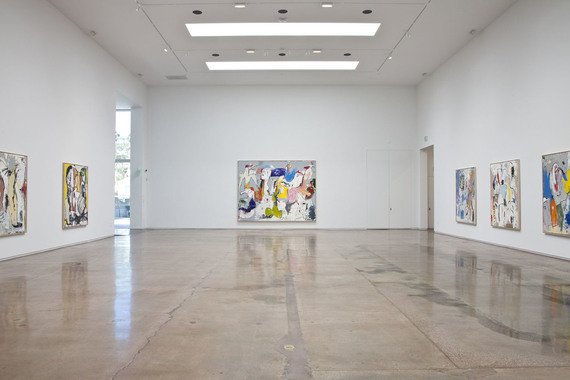 Susanne Vielmetter will be dedicating her entire Los Angeles space to Benning's work in February. Sadie Benning. Courtesy of Callicoon Fine Arts, New York City. I have been a fan of Bernhardt's work for years, and included her in a group "portraiture" show at my gallery a few years back. She is part of CANADA gallery's extraordinary and decade-defining stable (three of the artists in MoMA's aforementioned painting show are CANADA artists), so barely an art fair has gone by where I have not seen new work. Bernhardt became known for her "model" paintings -- vigorous and slightly grotesque portraits of supermodels -- in the mid-2000s. I liked these paintings. By 2010, she began exhibiting paintings that were essentially abstractions, based on Moroccan carpets. I really liked these. In the past year, Bernhardt stopped collecting her imagery from source material and began to excavate the depths of her imagination, and the paintings that have resulted are the best of her career. Basketballs, cell phones, hamburgers, fruit and all manner of the everyday are let loose, and float in vast fields of color. 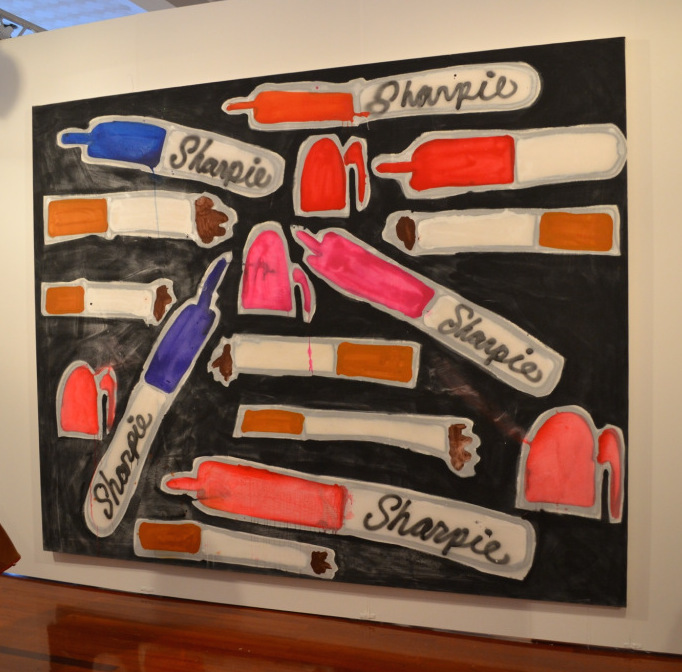 Her painting of Sharpies and cigarettes at China Art Objects booth at NADA Miami Art Fair was the best thing I saw at the fair, and one of the best paintings I saw in Miami this year. Katherine Bernhardt. Courtesy of China Art Objects, Los Angeles. It is funny how early memories stick with us so strongly. I had not been a working member of the art world for long when I first saw Bradford's work at Bernard Toale Gallery in Boston. It was also the first time that I ever met Bernie . . . it took us a couple of more meetings to warm up to each other. 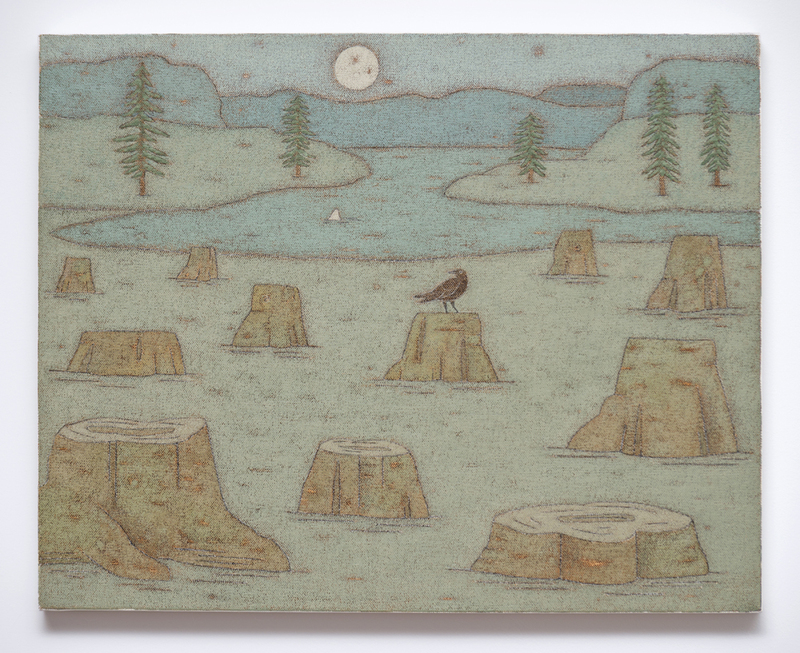 Bradford came back on my radar in 2008 when my buddy Camilo Alvarez gave her a solo show at Samson Projects, also in Boston. I have been avidly following her work ever since. It is rare to find artists these days who steadfastly pursue a unique vision over an extended period of time, not allowing any static from the wider art world to enter their practice. Bradford is such a painter. Her often intimately scaled works are just indescribably "right." Ghostly figures, a theatric use of light, teasingly oblique narratives and the type of paint handling ability that can only be won over years of practice all add up to one potent image after another. Albuquerque-based dealer Richard Levy was brimming with excitement about the group of Bradford paintings he presented at Miami Project this year, and people took notice. Katherine Bradford. Courtesy Adams and Ollman, Portland. Burgher has been a known figure in Chicago's burgeoning art scene for the better part of a decade. When Anthony Helms included him in the 2014 Whitney Biennial, his work gained exposure to a much wider audience. 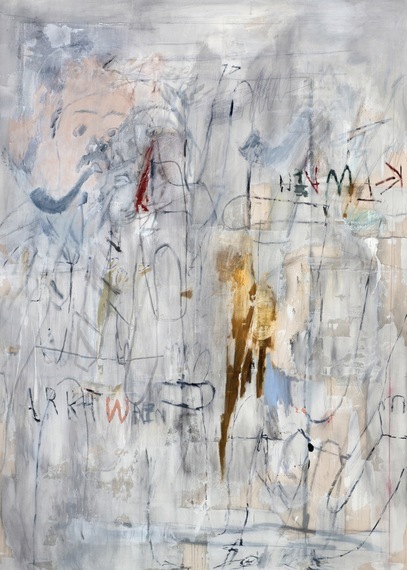 Burgher's current practice vacillates between his extraordinarily intricate colored pencil works on paper, in which the figure is often present, and much larger acrylic on canvas drop cloth works which are essentially abstract and filled with a growing lexicon of personal symbols. There is a sort of mysticism active in Burgher's work, although no mater how intangible his intentions might be, the work always seems to come back to the body. New York will have a chance to more carefully consider his practice in 2015 when Zieher Smith & Horton give him a one-man exhibition. Elijah Burgher. Courtesy of Western Exhibitions, Chicago. Sometime in early 1997, I became aware of Jaqueline Cedar's work. I was impressed, and, as I often do when work catches me the right way, I reached out to set up a studio visit. Cedar had just finished a BFA at UCLA and had already been accepted to Columbia's prestigious MFA program. She was in transition, so when I visited her it was at her parents' house outside Los Angeles. I walked in, and she had set up a number of large canvases in the living room and, possibly, the kitchen, if I remember correctly. As was quickly evident that day, Cedar is a true natural painter. The work I saw that day was, perhaps, a bit too indebted to Dana Schutz, but it was nevertheless shockingly good for a young painter. She had it all: a fluid and unencumbered line, an intuitive sense of color and fearlessness about working on a heroic scale. It was a great studio visit, and more have taken place since she moved to New York. Each time I have gone to her studio, I have been more and more impressed, but something always told me that she was still coming into her own. In 2014, Cedar found her stride. It is difficult to describe what the change is -- maybe a certain looseness, a more nuanced handling of space -- but whatever it is, it works. I know a number of painters in New York who truly admire her work. Cedar currently has a one-woman show at the artist-run space 106 Green in Brooklyn. If you are in New York, be sure to see it before January 11, 2015, when it closes. Jaqueline Cedar. Courtesy of 106 Green Gallery, Brooklyn. Dilg is the elder statesman on this list. For close to forty years, he has been teaching at the University of Iowa, where he has influenced hundreds of emerging artists. I have known Dilg's work since the mid-1990s, when he appeared in an early issue of New American Paintings, and, for whatever reason, it has always stuck with me, even though I rarely encountered it in the intervening years. His intimate and idiosyncratic paintings, which include imagery largely drawn from the American landscape, do not scream for attention, yet when given it, they emanate a restrained power that only the best art possesses. Dilg is on this list not because his work has made a radical turn in terms of subject or facture, but because, after overlooking his unique vision for decades, the world seems to finally be catching up. Over the past few years, the hip New York-based artist-run space Regina Rex has actively promoted his work. Jeff Bailey just presented him in the context of a two-person show at his new Hudson, New York, space, and in the interest of full disclosure, I did a solo show with him earlier this year. I expect that we will be seeing a lot more of Dilg in 2015 and beyond. John Dilg. Courtesy of Jeff Bailey Gallery, Hudson, NY. A few years ago, my friend Kristen Dodge called me and said: "Zevitas, you have to check out Ted Gahl. You will love his work." She likely tried to sell me a painting as well . . . man, could that girl sell. Gahl is very much a painter's painter. Every painting by him that I have seen evinces the same sort of internal struggle. The figure and other traces of the real world emerge briefly and then effortlessly dissolve back into pure abstraction. 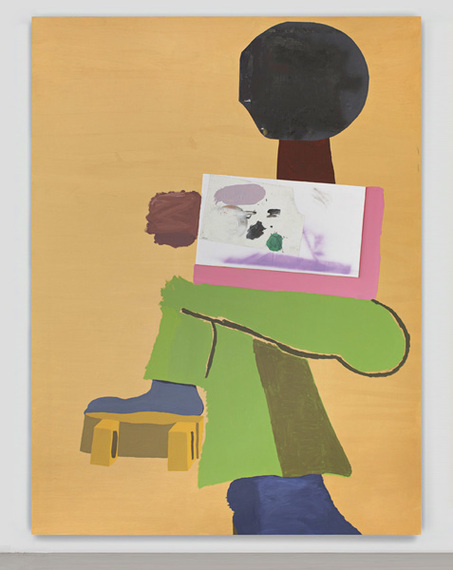 Like Philip Guston, Amy Sillman and a number of other accomplished painters, there is no real delineation between the activities of drawing and painting in Gahl's work, which gives it a restless, probing quality. 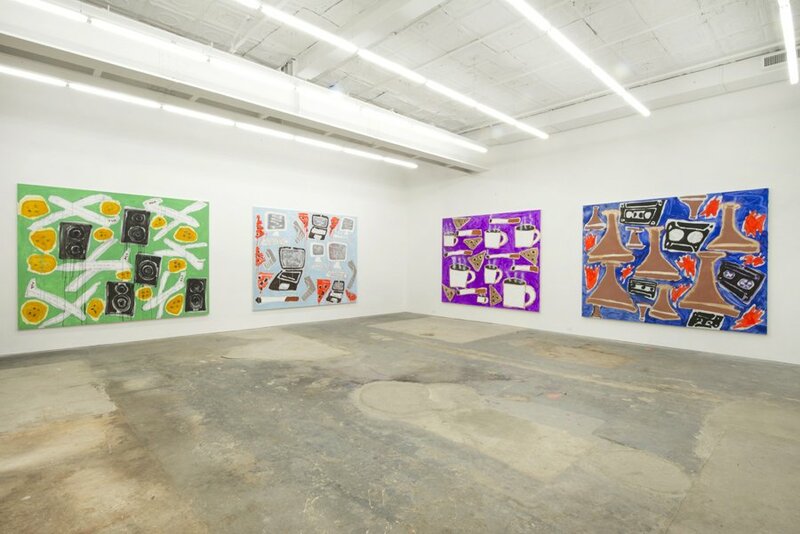 2014 was a busy year for Gahl, as his work was exhibited in no less than twenty one-man and group exhibitions, including a current solo show at Zach Feuer in New York City. Ted Gahl. Courtesy Zach Feuer, New York City. 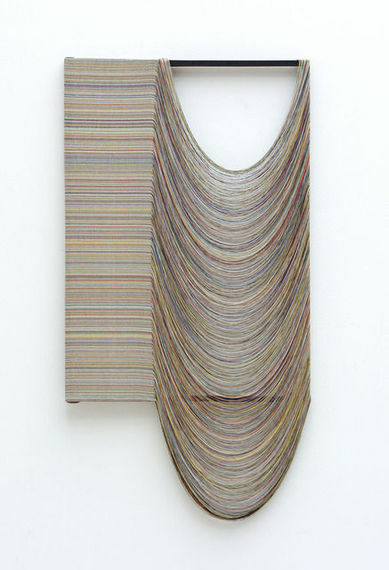 I wasn't familiar with Garber-Maikovska's work until I walked into his 2012 solo at Greene Exhibitions in Los Angeles. 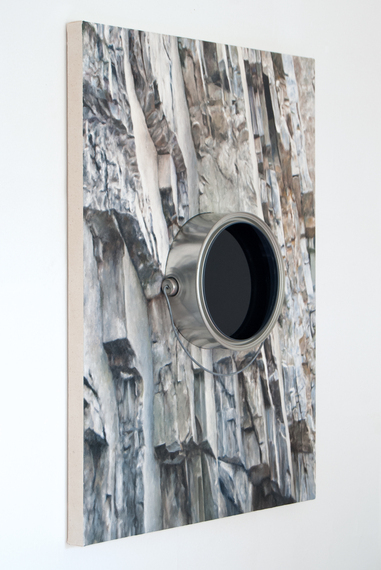 My next run in with it was at Standard Oslo's booth at Frieze New York 2014 (the taste making Norwegian gallery also gave him a solo in early 2014). 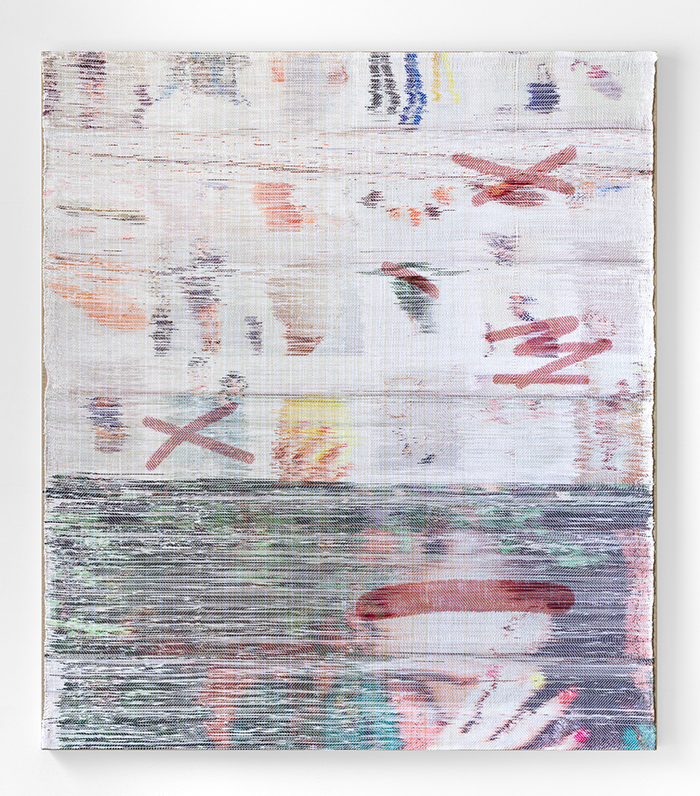 It is tough to know whether Garber-Maikovska's works are drawings masquerading as paintings, or the other way around (he also makes video works). Whatever you call them, it is his probing, meandering line that will first capture your attention. Graffiti, Chinese calligraphy, Carroll Dunham and a host of other graphic impulses ooze out of these paintings that, because of their human scale, feel quasi-figurative. More than offering you an image to contemplate though, Garber-Maikovska makes you acutely aware of your own body and the freedom you have to move and gesture. Aaron Garber-Maikovska. Courtesy of Greene Exhibitions, Los Angeles. I have been a fan of Heidkamp's work for a long time, and I have always wondered why we were not seeing a lot more of it. That started to change in 2014, as he appeared in three well-received group shows: Ticket to Reality at Marlborough Chelsea, The Great Figure at The Journal Gallery in Brooklyn -- which closes next week -- and a show at White Columns. In these shows, his work more than held its own with the likes of Henry Taylor, Alice Neel and Dana Schutz. There is no artifice with Heidkamp's work, and no hidden subtext. 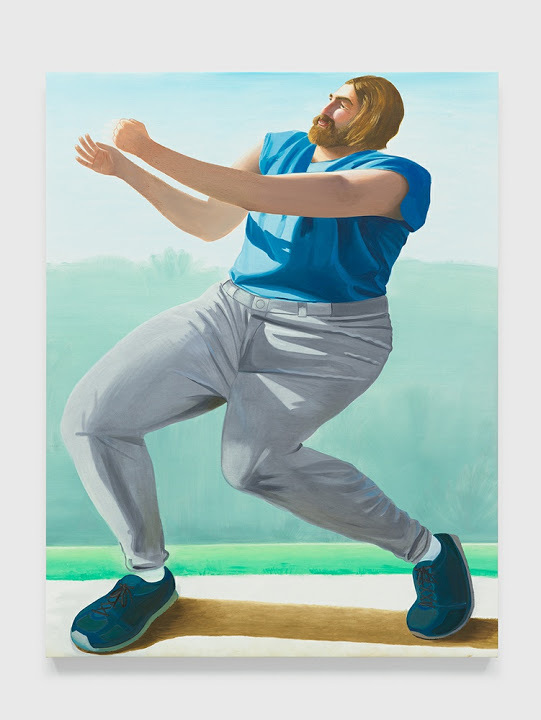 Sure, his work relies on the kind of high-keyed palette and off-kilter compositional strategies used by a number of his peers, but Heidkamp is clearly his own painter. His subject matter is the people and places that interest him. Often working en plein air, he will then rework subjects on a larger scale and with more intense detail in the studio. So there it is: a painter who loves the stuff of paint and the activity of painting. Maybe we are finally getting to a point where these are things to once again value. Daniel Heidkamp. Courtesy of The Journal Gallery, Brooklyn. Like Katherine Bernhardt, Martinez is not exactly an unknown quantity; he has been exhibiting internationally for close to a decade. Not long after completing the culminating masterpiece of the first phase of his career, a twenty-eight-foot-wide painting titled The Feast, which was presented at Art Basel Miami in 2010 and quickly purchased by Charles Saatchi, Martinez left his New York gallery. Many long-term fans of his work wondered what was going on. Subsequently, there was an occasional sighting of a new painting at an art fair, and rumors had it that Martinez was moving toward abstraction. 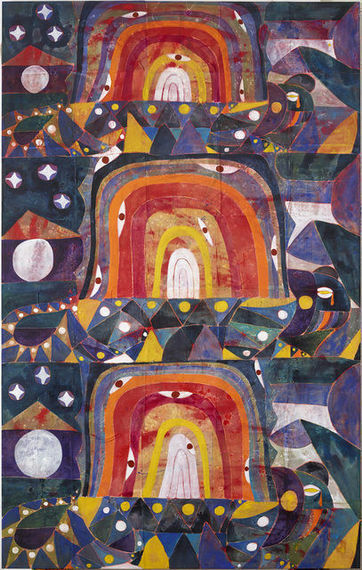 Some small shows followed that gave credence to the rumors, as Martinez's trademark "figures" drifted away and were replaced by more abstract, totemic forms. Then came 2014. Martinez reemerged with one-man exhibitions in rapid succession at Kohn Gallery's new digs in Los Angeles and at Timothy Taylor Gallery in London. I am an admitted Martinez junkie, but I would not be using hyperbole were I to say that he has produced a body of breakthrough work. The new paintings are large, fearlessly painted and deadly serious. The figure is still there somewhere, but Martinez himself has never been more there. Judging by the lengthy waiting lists that have accumulated, Martinez has quickly become one of the most sought-after painters on the planet. Eddie Martinez. Courtesy of Timothy Taylor Gallery, London. I was familiar with Charles Mayton only by name and JPEG until his early 2014 solo at David Lewis Gallery in New York City. Mayton is very much a painter of this specific moment, which is to say that he seems somewhat distrustful of the activity of painting itself. In contrast to many likeminded artists, however, Mayton cannot quite hide his obvious love of the medium. While many of his colleagues may find themselves wandering down an aesthetic cul-de-sac, my sense is that Mayton has many potential directions to move. As I spent time with his show, I vacillated between an engagement with the stuff of paint and the more intellectual substrata that he is clearly interested in exploring. By all accounts, his late September exhibition at Campoli Presti was an equally strong endeavor. Definitely one to watch. Charles Mayton. Courtesy of Campoli Presti, London and Paris. So here is a good story. 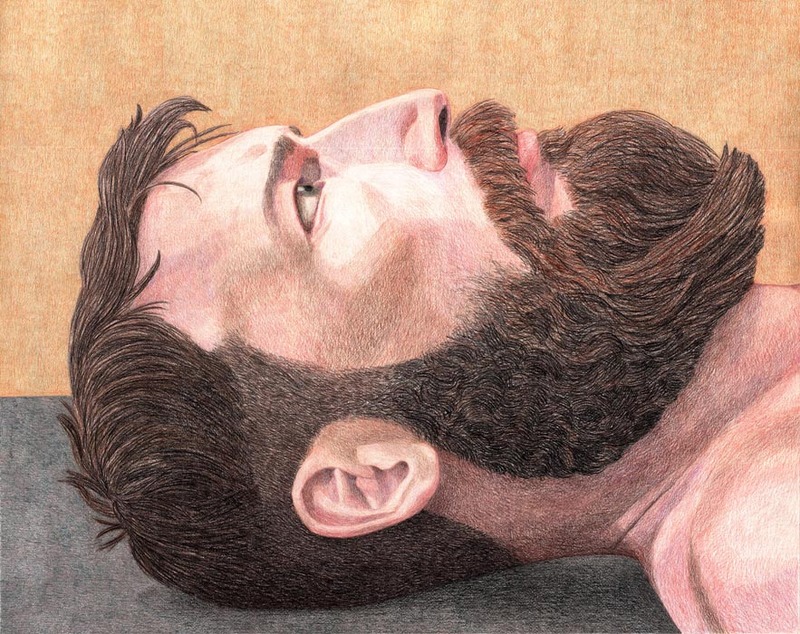 Pionskowki was an applicant to New American Paintings's 2012 Midwest Competition. That competition's juror, Lisa Freiman, now the director of the VCU Institute of Contemporary Art and all-around amazing person, selected him to be featured. Shortly thereafter, one of Freiman's colleagues, the equally cool Veronica Roberts, was in search of emerging artists for a show that she was curating at Galerie Lelong in New York City. I gave Roberts permission to review the Midwest issue before publication, and lo and behold, a young Pionkowski suddenly found himself in a major group show. I have been watching his development carefully ever since. Canvas must really fear Pionkowski, as his work typically involves deconstructing it, then weaving, reconstructing, coloring and doing just about anything else he wants to it. The results are objects that hover between painting, sculpture and textile, and they are as complex as they are beautiful. My most recent encounter with Pionkowski's work was at The Hole's booth at NADA Miami, where they stood out against a sea of virtually interchangeable Zombie Paintings. Gabriel Pionkowksi. Courtesy of The Hole, New York City. He may have just graduated from Cooper Union two years ago, but Thorton is already causing an international stir. His recent show at ultra-hip OHWOW was a feeding frenzy for collectors, and in a few short months Thorton will have a one-man show at Modern Art in London. 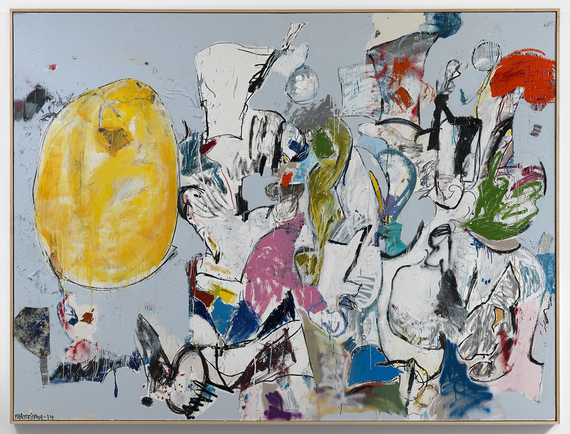 Those attending Art Basel Miami Beach this year could not help but notice a large Thorton painting strategically placed at the front of Modern Art's ever-busy booth. Only in our Internet-driven, obsessed-with-the-new culture could an artist ascend this quickly. And guess what? He is actually a very good painter. Thornton possesses the sort of rangy graphic sensibility that allows him to push things to the point of chaos, yet always retain control. It is one of those skills you can't learn, and you certainly can't fake. His sense of color is equally dangerous. All of this combined with Thornton's penchant for imagery, which is at once streetwise and mythic, and you end up with some impressive, collector-enticing paintings. Torey Thornton. Courtesy of OHWOW, Los Angeles. 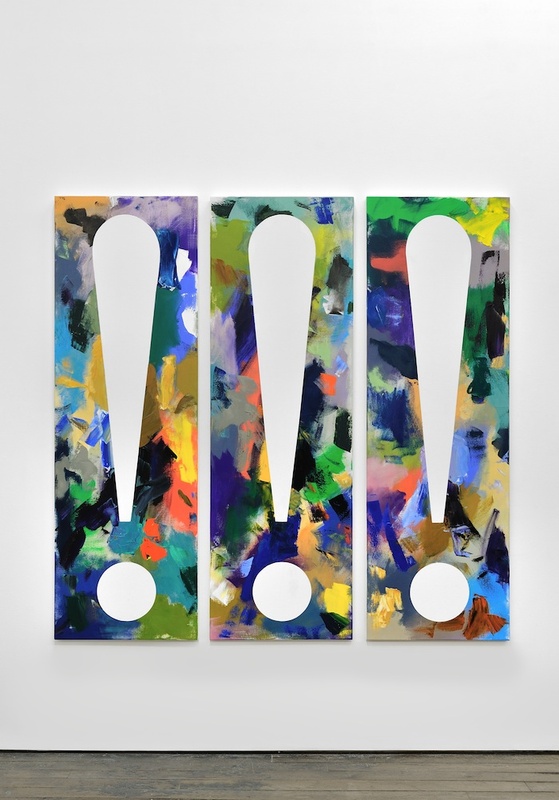 Danish artist Alexander Tovborg has been making a name for himself in Europe since 2010, but was really not known in the States until his soon-to-close show opened at Nicelle Beauchene Gallery on New York's Lower East Side. His obsessive paintings are replete with references to textiles, outsider art and the work of early modern masters (Tal R, Christoph Ruckhaberle and other contemporary painters also come to mind). 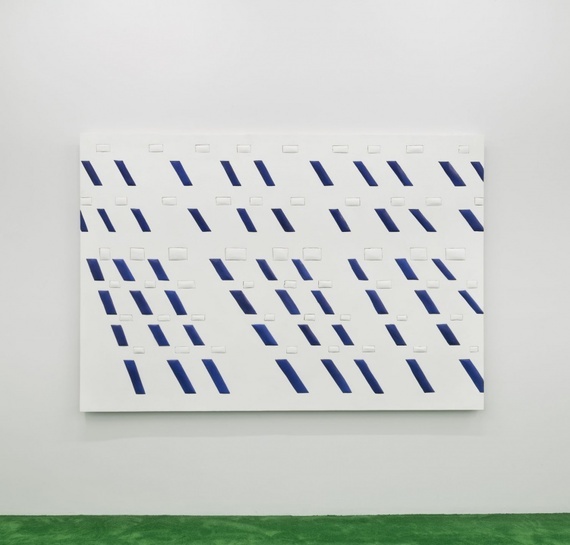 The paintings in Beauchene's show seem virtually identical at first -- an impression that is aided by their tight linear installation on a single wall -- but one quickly begins to notice all manner of difference in their facture and details. 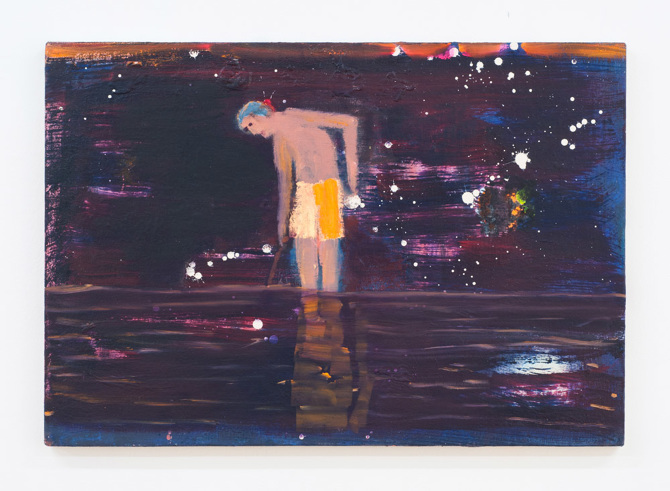 I liked the exhibition, but what really got me excited about Tovborg's work was the towering painting on view at Galleri Nicolai Wallner's booth at Art Basel Miami Beach. It was one of the best paintings on view at the fair this year. Alexander Tovborg, Courtesy of Galleri Nicolai Wallner, Copenhagen. 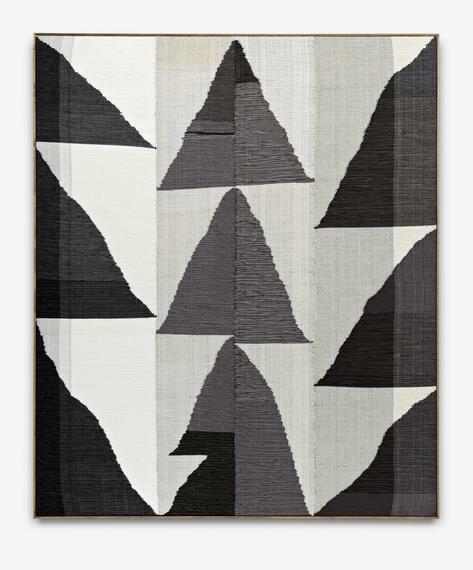 Brent Wadden. Courtesy of Mitchell-Innes & Nash, New York City. Of all the artists on this list, Winner is the one that I am least familiar with. In fact, I first heard his name, met him and saw his work while setting up my booth at the UNTITLED Fair in Miami two weeks ago. My neighbor across the way was the fabulous Josee Bienvenu. As she was showing me around her typically immaculate booth a small painting in one corner caught my eye. It was ostensibly monochromatic, although closer inspection revealed a range of colors buried underneath the off-white top layer of paint. Bienvenu pulled out additional works - all intimately-scaled - and each one presented itself as another hard-won gem. Winner's sense of internal structure has something to do with Stella, and his ability to attend precisely to every inch of his work reminds me of Johns. Those influences, however, do not overshadow a clearly individual practice. And collectors...the price is still right. Adam Winner. Courtesy of Josee Bienvenu Gallery, New York City. 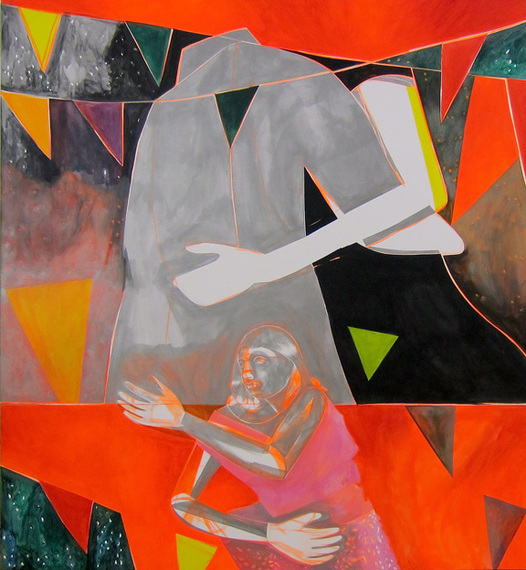 I first saw Wolowiec's work at a 2013 California College of the Arts Thesis Exhibition in San Francisco. I stopped by with a friend of mine, who pointed the work out. It looked good. I missed her one-person show at Anat Ebgi in Los Angeles in 2014, so I was excited that Ebgi was bringing her work to the NADA Miami Art Fair later that year. If you only looked at reproductions, you might be tempted to lump Wolowiec in with the dozens of other artists now busy producing Process Painting, or what many have now begun to call Zombie Painting. Seeing them in person is a must. Wolowiec's "process" is extraordinarily nuanced and labor-intensive. Culling images from social media sites, she prints them pixel by pixel onto threads of material that are then woven to create a textile. There is an amazing buzz that occurs as digital and handmade collide. Collectors in Miami liked the work and quickly snapped them up, which bodes well for Lisa Cooley, who will have a one-woman show of Wolowiec's work at her New York space in 2015. Margo Wolowiec. Courtesy of Anat Ebgi, Los Angeles. New American Paintings magazine is a juried exhibition-in-print, and the largest series of artist competitions in the United States. Working with experienced curators, New American Paintings reviews the work of thousands of emerging artists each year. Forty artists are selected to appear in each bi-monthly edition, many of whom go on to receive substantial critical and commercial success. Additional content focuses on the medium of painting, those who influence its direction and the role contemporary painting plays within the art world. Visit New American Paintings for more information or to subscribe.